Posted December 6, 2010 by Bryon Williams & filed under Article Library, Technical Papers. Written by: Doug Brockelbank, Application’s Specialist, Sales Dept., The Montalvo Corp. Variable Wrap Angle Technology™, a Montalvo exclusive, improves on conventional web tension measurement and control by eliminating the need for isolation of the tension sensing roll with a lead-in or lead-out idler roll, saving money and valuable machine real estate. Wrap Angle is a measurement in degrees of the diameter of a sensor roller that the tensioned material contacts. Most tension sensing rollers have a minimum and maximum wrap angle they are compatible with. Variable wrap angle technology allows installation of load cells for web tension measurement and control on the first idler roll after an unwind roll, or on the last idler roll prior to the rewinder. This means customers can save space and save money by installing fewer idler rolls on the machine. Additionally, the technology may allow the retrofit of a closed-loop tension control system where it was not thought possible before due to space and cost restrictions. This system can also be used where the material being processed may only contact a roll on one side, such as with sensitive coatings or adhesives. 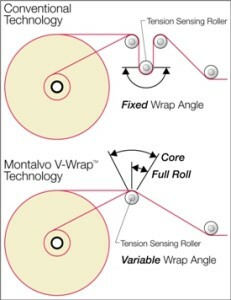 Variable Wrap Angle technology is featured on all Montalvo CB-64-based tension controllers. The CB-64 control system is the first and only stand-alone tension controller in the industry with this capability. Until now, accurate web tension measurement required a fixed wrap angle around the load sensing roll, or load cell roll. If the angle around the load cell roll changes, as with the changing diameter of an unwinding or rewinding roll of material, the effective force on the load cell changes. In a closed-loop control system, the result would be inaccurate tension readings, and inconsistent tension control. This requires that the load cells be mounted on at least the second roll in from the unwind end, or the second to last roll on the rewind end, providing a fixed wrap angle around the tension sensing roll. In some instances, this can be impractical for retrofit applications due to space limitations and/or cost of a new idler roll. But now, with Montalvo’s exclusive Variable Wrap Angle Technology, the first or last roller can be used for tension measurement and control. By entering in a few key reference points, and monitoring the roll unwind or rewind roll diameter, the Montalvo algorithms can accurately calculate the exact web position and compensate for the changing angle around the load cell roll. The result is precise, repeatable tension control with one less idler roll in the system. This feature comes standard on all Montalvo CB-64 load cell based tension controllers. The CB-64 Controller can be configured as an unwind controller, rewind controller or intermediate tension zone controller. Other features that benefit users include progressive gain technology, soft-start and anti-coast features, range expander capabilities for maximum brake efficiency, and common fieldbus communication protocols for extreme flexibility. The Montalvo Corporation specializes in the analyzing, upgrading and servicing of customer’s web tension control equipment. For more than 60 years, Montalvo has manufactured, integrated and serviced a wide range of web control products and systems for the converting, paper, foil, nonwovens, and plastic film industries as well as packaging, medical and high-tech applications. Montalvo products include electronic tension control devices, load cells, indicators, brakes, clutches, and safety chucks. Montalvo manufactures in the United States, and sells worldwide.